Utilizes the Bernoulli (Swiss scientist) effect where the reduced pressure of a stream of fluid (wine) draws an air flow through diagonal thin tubes inside the DECANTUS TM. Experience softer tannins, increased bouquet and enhanced flavor. 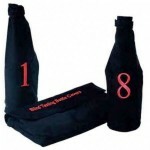 Removable lid for covering contents for restaurants, wine bars, and winery tasting rooms.7-1/4 inches long. SKU: 7716. Category: Gizmos Gadgets. The Decantis Aero Aerating Pourer. Better than Vinturi! 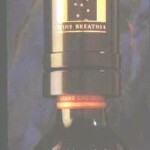 All wine need to react with air to reveal its fullest flavor and bouquet. This fact was recognized and a way was soon developed to rapidly oxidize wine in seconds. The Decantis Aero Aerator Sets utilize the Bernoulli (a Swiss scientist) effect where the reduced pressure of a stream of fluid draws an air flow through diagonal thin tubes inside the aerator. The wider opening on top and larger liquid capacity of the top reservoir bowl makes pouring into the DECANTIS™ wine aerators much easier than with the Vinturi Aerator. Wine travels faster through it without a whirlpool effect. This is because of the vertical planar insert. The “froth” from DECANTIS™ has finer bubbles. This gives a smoother aeration over any other aerator on the market. This set includes the handles as part of the package. Statistic tests show a significantly better aeration rate along with a remarkable 56% decline in sulfite levels! Announcing the latest developments in immediate wine aeration technology! A must have for all wine enthusiasts!! 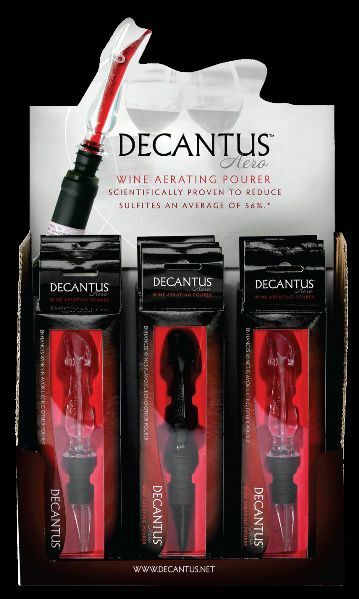 The Decantis Aero aerating pourer utilizes the Bernoulli effect where the reduced pressure of a stream of fluid draws an air flow through diagonal thin tubes inside to rapidly aerate and to effectively decrease the presence of nitrates in wines. This process dramatically “softens” the wine and opens up the forward fruit aromas. 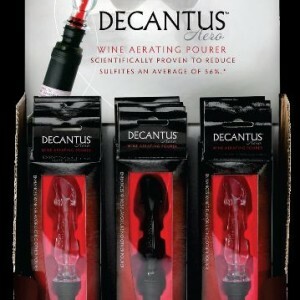 Be the first to review “Decantis Aero Aerating Pourer” Click here to cancel reply. YOU GET WHAT YOU PAY FOR. Sometimes saving a few dollars on a less expensive item that looks the same as another one is quite often a poor choice. Why buy the original when a cheaper knock-off is available? It’s because the original LASTS LONGEST! We are always looking for top of the line products to offer to our customers. A good example is our custom wine cooling split air systems. They are commercial quality and designed to last 15-20 years. The others are not! The list goes on and on. We strive to maintain the best customer service available today. When you call us you are NOT calling an operator. 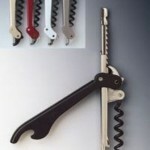 You are directly calling the people that are the most knowledgeable in the wine accessories industry. If we don’t stock it …… we’ll try to find it! We are the exclusive importers for many fine wine related products. I personally bring in port tongs from Portugal, the Ah-So 2 pronged cork puller from Germany , the Air Au Vin wine aerators from Great Britain, and the “Clef du Vin” ageing diagnostic tool from France. 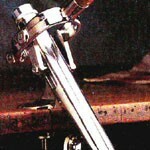 I carry and maintain the original Pulltaps from Spain, and do not sell the knock-offs. Welcome to Wine Accessory.com © 2019. All Rights Reserved.